RCM-0601PT has 6 needles, 1 head, 1200 spm, 22x14 inch field, LCD display, usb port, network port, wifi, thread break detection. 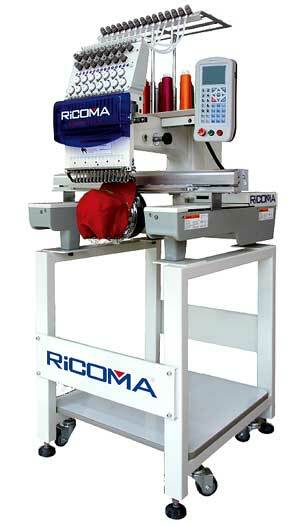 Ricoma RCM-0601PT 6 Needle Single Head Embroidery Machine. 6 needles, one head, suitable for flat bed embroidery, cap / hat embroidery, finished garments embroidery and more. LCD display showing real time stitching. Memory size: 1,000,000 stitches and 99 designs. Servo motor 150W – lowest power consumption in the industry. Ricoma RCM-0601PT Compact Control Panel. 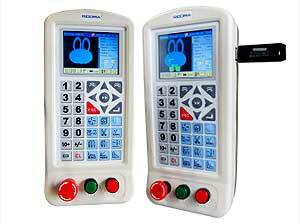 4 inches High Definition (300X420) Color LCD display showing real time stitching, date and time. Emergency Stop only stops the moving parts while the parameters and data remain. Function keys including Menu, Speed up and down, Help, Design Input, Parameter Settings, Clear, ESC, Enter, etc. Frame-moving keys, in slow or fast mode. Manual color change key available. 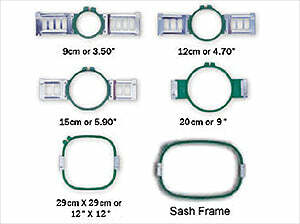 Rotate designs to the angle of your choice. Dot Key to return to 100 degrees or select any degrees digitally with the number showing on screen – no more guess work. 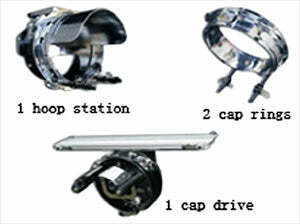 Cap to shirt switch or vice versa with pre-settings in system, greatly reducing the possibility of hitting the frame. Based on 32-bit computer technology, capable of reading any size of USB memory stick. Keep original file name for easy design management. Ricoma RCM-0601PT Frames / Hoops Included. Ricoma RCM-0601PT Cap Attachment Included.